Well, this is Colorado and hiking is a staple for any Colorado getaway. Durango has the best places to hike. Unplug and reconnect with nature on the mountain trails. Breathe in the fresh mountain air. Camping is the ultimate way to explore the great outdoors. Spend a night sleeping under the stars. Count constellations. Listen to the sound of a crackling wood-burning fire. Share some s’mores with your family. Camping in the mountains of Durango will leave you revitalized. Or if camping isn’t your thing, Blue Lake Ranch is a wonderful choice that still allows you to leave the rest of the world behind while enjoying warm hospitality and luxurious accommodations. Spanish for green table, Mesa Verde gives you an up close look into the lives of the Ancestral Pueblo people who lived there for over 700 years. Some of the most preserved ancient dwellings in the U.S., Mesa Verde is home to nearly 5,000 archeological sites. 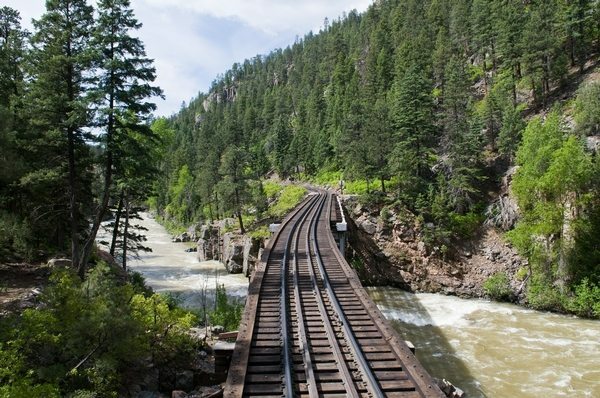 Take a ride back in time to 1882 on the Durango & Silverton Narrow Gauge Railroad. Wind your way through 45 miles of the beautiful mountain wilderness on a steam-powered train. Choo Choo! Grab the family and sail down the river – the Animas River that is. Instead of smooth sailing, you’ll love the thrill of the choppy rapids and twists and turns of the river. A must do while visiting the Durango area. Speaking of rivers, the Animas River is one of many fishing hot spots. Fly fishing, spin fishing…it doesn’t matter which type of fishing you prefer. You will enjoy the great outdoors and the solitude of award-winning fishing here in Durango. Experience Durango by horseback. You will enjoy the beautiful scenery from a completely different perspective. Durango is home to majestic mountains, soothing rivers and winding wooded trails. Take your family for an excursion they will never forget. Giddy up! Do you really need an 8th reason why visiting Durango is awesome? Of course our list could go on and on, but this is a good start. If numbers 1-7 on our list hasn’t caused you to plan a Durango getaway, check your pulse! Your Durango getaway will be exciting and has something for everyone. See you soon!